Dog playpens can be used for a variety of purposes from potty training to containment. They are a great way to let your dog to play and run around without giving them the freedom to explore your whole house, apartment, or yard. Like other items for dogs, there are various types of dog playpens to choose from. The one you need will depend on how you plan on using it and the type of dog you have. Which Dog Playpen Should I Buy? Plastic playpens are a popular option because they’re relatively durable, affordable, and can be used inside and outside. They’re great because they’re lightweight, less likely to damage your floors and don’t rust, but they can be chewed through over time. Metal playpens are a little more expensive than their plastic counterparts but they are also more durable. These pens are best for indoor use but they can scratch flooring and owners should be careful to make sure that there are no parts sticking out that can hurt their dog. Mesh playpens are the least expensive option but they’re also the least durable. This is not a good option for destructive dogs who like to chew and they aren’t great at containing large breeds. On the plus side, they are lightweight and portable. A few other things to keep in mind when looking for the ideal dog playpen are the size and if you’ll need a cover to keep your dog from jumping out and escaping. Midwest Exercise Pen is offered in heights ranging from 24 inches for smaller dogs to 48 inches for larger dogs. Each pen comes with eight panels and provides dogs with 16 square feet of space to play and roam around. This playpen comes in either black with no door, black with a door, or gold zinc with a door. This durable dog playpen comes with eight ground anchors for outdoor use and four thumb-snaps for easy assembly without the need for any tools. A black e-coat finish protects this pen from rust, making it great for both indoor and outdoor use. The pen comes with a one-year manufacturer’s warranty so you’re covered if there are any defects. One thing that owners dislike about this pen is that the hardware that comes with it is somewhat flimsy. Overall, this playpen is durable and collapsible for easy storage and transportation. The door to this playpen has two latches to reduce the chance of breakage or escape and the panels can easily be customized to suit any space or need. OxGord Pet Exercise Pen is durable, made for both indoor and outdoor use, and ranges from 24 to 48 inches in height. It’s super convenient to set-up, break down, and take with you whenever and wherever your dog will need it. When assembled in an octagon shape the space inside has a diameter of 73 inches. Unlike plain metal dog playpens, this one has a rust-resistant coating to ensure durability and longevity when used in an outdoor setting. This playpen is a great choice because it’s easy to assemble and uses a locking mechanism to keep dogs safely inside. Like other playpens with panels, this one can be configured to suit the space you’re in. Two sets can even be combined to create a larger area for multiple dogs to play in. Owners love the quality of this playpen and the affordable price. One important thing to keep in mind is that since there’s no cover, dogs should be supervised – especially if they can jump high enough to get out. 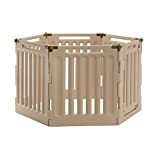 While owners do say it’s a little heavy, this playpen is perfect for containing larger dogs who might destroy a flimsier playpen. IRIS Pet Playpen with Door is 24 inches tall and comes with four panels. There’s an optional two-panel add-on for more expansion options and an optional mesh roof. This playpen is available in a total of 9 different colors: blue, brown, chrome, grey, green, pink, red, white, and frosty white. This playpen is convenient and portable. The standard size offers eight square feet of playing space for your dog. This playpen is made with durable, heavy-duty molded plastic and is made in the USA. Some other benefits of this pen are that it’s lightweight and easy to assemble or take apart. It also has non-skid rubber feet to keep your floors protected from damage. This playpen is ideal for puppies and small dogs who are being trained or need a safe space to run around. One of the issues noted by customers is that even though this pen is durable, it can be pushed out of shape and it’s possible for some dogs to escape if this isn’t dealt with. Without the mesh roof, some dogs may be able to climb or jump out. Despite these minor issues, this is still a high-quality affordable option and any challenges can easily be fixed with a little creativity. Richell Convertible Pet Playpen comes in either four or six panels. This playpen is great because it’s a 3-in-1 convertible solution that can be used not only as a playpen but also as a pet gate and room divider. Because of its specially designed waterproof arrows, this durable plastic playpen can be used both indoors and outdoors. Owners should be aware that this playpen is ideal for dogs who weigh 88 pounds or less. In addition to its versatility, this playpen looks great in any space and has a gate door that locks easily let your dog in and out when needed. Since there’s only 1 ¼ inch of space between the plastic slats, dogs are less likely to get their paws stuck or hurt. Dog owners love how easy and convenient it is to change this playpen’s shape as needed. It is lightweight which makes it even easier to move around than metal ones but that means it can also be tipped over by larger dogs. Even though it’s a little more expensive than other options out there, if you have a small dog it’s worth it for the quality and practicality. Which Playpen is Best for Your Pup? If you want your dog to be able to roam around rather than be kept in a crate while you’re away, a playpen can be a great option. They’re also perfect for keeping your dog contained in one spot in the yard or when guests are over. They can be used to containing your dog’s potty training area too. Being aware of the pros and cons of different dog playpens can help you find the one that is best suited to your dog’s needs the first time around. Learning from other people’s experiences with top rated dog pens is a great way to avoid wasting time and money buying the wrong thing. » Check out all puppy and dog playpens available on Amazon.